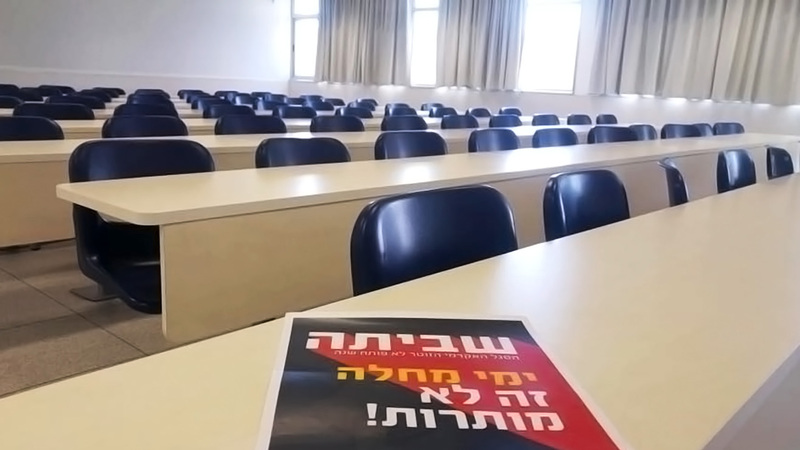 Empty classroom at Ben Gurion University during a two week-long strike in October 2018. 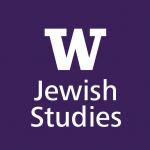 Recently, labor disputes at two world-renowned public institutions in Israel have called into question larger issues of academic freedom. 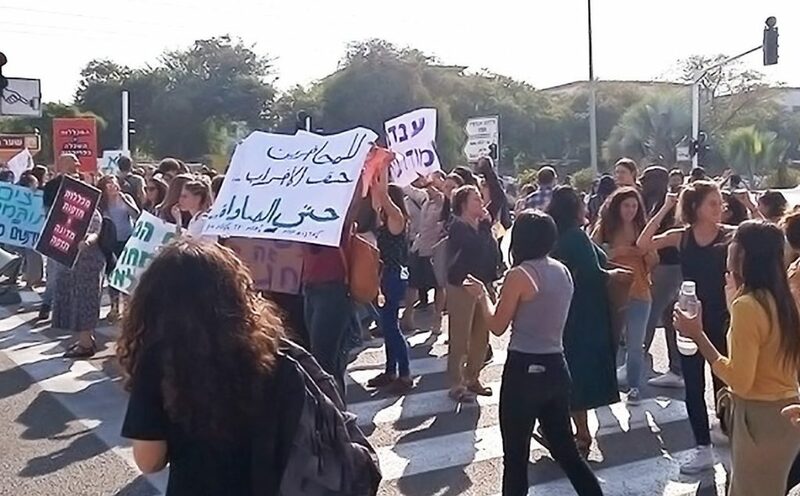 This past October, strikes by junior staff in Tel Aviv and Ben Gurion Universities, accompanied by the five-week-long strike in Israeli public academic colleges (10/21-11/22), affected over 20,000 students. Despite the great impact on students, the Minister of Education and head of the religious-Zionist “Jewish Home” party, Naftali Bennet, did not comment on either of the strikes. Bennet comes from the technology industry and approaches labor issues with a business-oriented perspective. He once even stated that if his workers formed a union, he would consider that a personal failure. Although the Minister of Education in Israel chairs the Council for Higher Education and is therefore in charge of setting workers’ salaries at public universities and colleges, he has not publicly intervened in the crisis. Bennet’s conservative view of labor relations has likely contributed to his decision not to intervene and resolve the labor dispute, though I worry that the larger context is one where academic freedom is at stake. Jewish tradition teaches us of the importance of tenure. The 17th century Ashkenazi Tosafot Yom-Tov commentary on the Mishnah states that scholars agree teachers must have economic security in order to enable their learning and teaching of Torah. Indeed, academic freedom is not just an abstract value, but rather has a material existence in the form of academic tenure, considered to be one of the most valuable benefits of an academic research position. Similar to the lifetime tenure protecting judges, the academic tenure system is intended to guarantee that researchers will be committed to the pursuit of truth without fearing loss of their jobs. Under economic constraints in the early 1980s, the Israeli government undertook a project of liberalization and privatization, a trend that worked its way to higher education. Lecturers in Israeli universities felt this trend the most, as University administrations were pressured to move towards an “optimal” economic efficiency. Until the 1980s, there were only seven universities, all public research institutions, in all of Israel. However, an increase in demand for higher education in the 1990s led the Israeli government to allow the opening of private and public colleges. The government elected not to found another research university, which would have entailed large expenses to fund research. Instead, it preferred institutions offering professional training, undergraduate degrees and a limited number of master’s programs (somewhat similar to community colleges and smaller state colleges in the US). Research was not a formal part of the mission of these institutions, and most academic positions were not tenured. Job security was precarious. In many cases, lecturers were employed on temporary contracts that were renewed each semester. Similarly, within the universities, economic incentives pushed administrators to expand their programs and enroll more students. However, instead of hiring more tenured faculty, the universities began to increasingly rely on adjunct lecturers and graduate students to teach classes. In this case as well, these workers have not enjoyed job security, and their compensation has been considerably lower than tenure-track professors’. Today, over 70% of academic teaching in Israeli universities is carried out by adjunct lecturers and graduate students. While many adjuncts also perform research, they do not enjoy the same academic freedom as tenured faculty due to their lack of job security. Thus, a de facto caste system has been created within Israeli universities, in which — despite doing practically the same job — a small minority enjoys job security and benefits, while the positions of most workers are precarious. Adjunct faculty members are poorly compensated, sometimes teaching at several institutions to make ends meet. While tenured professors can publish controversial arguments without the fear of losing their jobs, the university is not even obligated to explain the reasons for laying off an adjunct lecturer, making them vulnerable to political censorship. Lately, under the rule of the Likud right-wing government, attacks on academic freedom have become more explicit. A recent example was Bennet’s appointment of Professor Asa Kasher (author of the Israeli military ethical code) to write a code for “appropriate behavior in higher education institutions regarding the overlap between political and academic activities,” which presents an ethical dilemma for the Israeli academy. According to Bennett’s office, the code will bar professors from voicing their political opinions in classrooms. Moreover, the Israeli government’s decision to step up its efforts to combat the BDS (“Boycott, Divest, Sanction”) movement has led to an increase in restrictions upon entry of foreign academics to Israel with BDS-sympathetic politics. 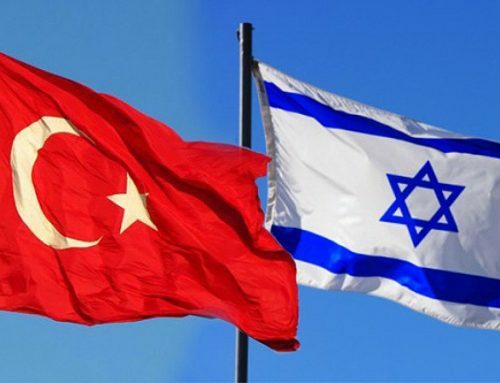 Visiting scholars have reported that they have been interrogated at the airport by Israeli secret services, and some political activists have been banned from entering Israel. 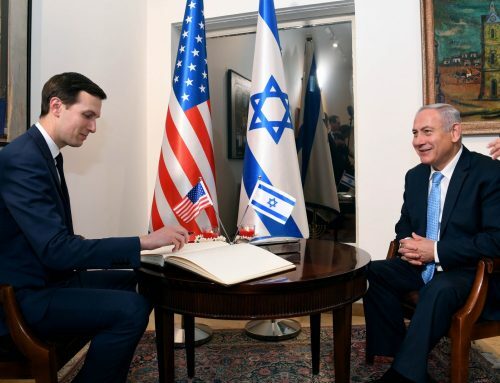 These developments even led to discussions within the Association for Israel Studies suggesting that they change the location of their upcoming 2019 annual meeting from Israel to the US, out of fear that some of their members would be denied entry due to their political opinions. 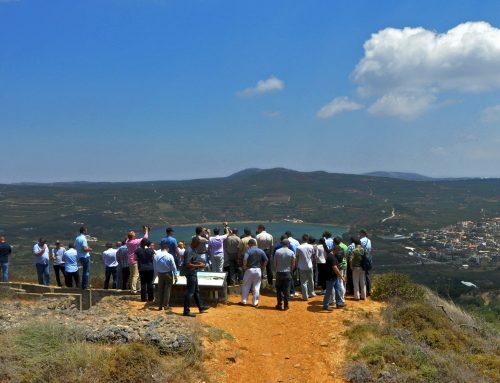 After assurances from the government that no AIS members would be turned away, the organization decided to keep the conference in Israel. These cases should worry anyone who is concerned about academic freedom in Israel and in general. However, the threat to academic freedom is not limited to a government code constraining what faculty can say in the classroom or to denial of entry to the state, but rather run deeper and are more deeply related to issues of job security. The October and November strikes at Israeli colleges and universities in 2018 ended with significant, though limited, success. 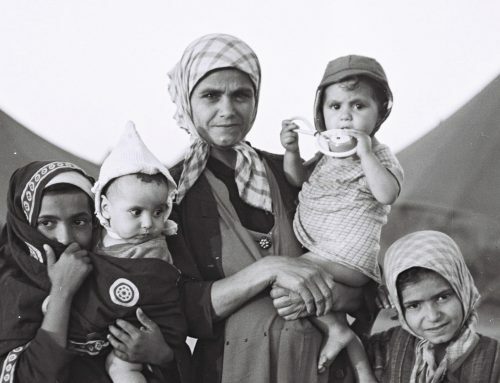 In Tel Aviv and Ben Gurion Universities, the unions were able to improve job security for part of the workers, though the situation remains far from ideal. In the colleges, the strikes ended only after intervention of the national labor court, which forced the parties to resume negotiations that are still in progress as of early 2019. Despite this state of affairs, the last strikes have also provided some room for optimism. For the first time, the unions received support from two unexpected sources. 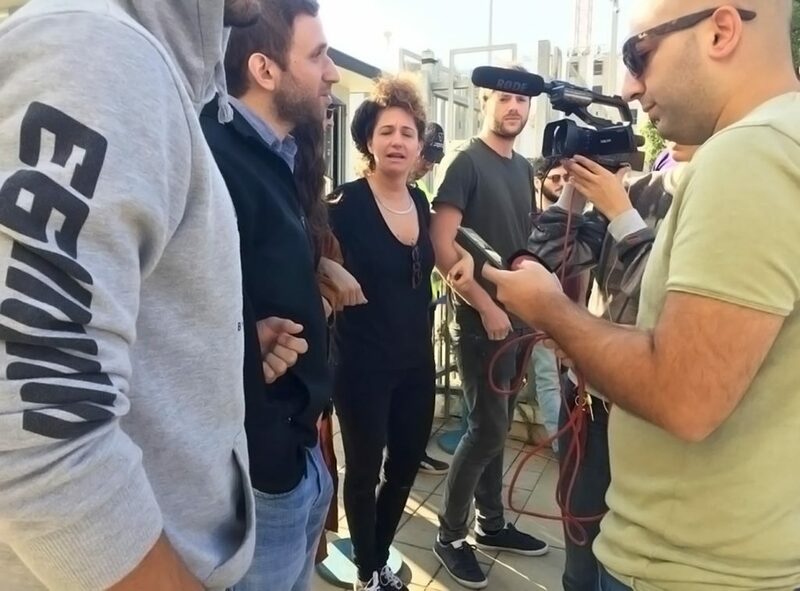 In Ben Gurion University, department chairs signed a petition supporting their peers’ struggle, and in the colleges the students joined the strike as well, in support of their teachers. As we learn from famous historical figures such as Socrates and Galileo, political freedom is crucial for the pursuit of knowledge. Frequently, the state will attempt to silence knowledge that it perceives as harmful, and the Israeli government is no different from its peers in this matter. However, these latest developments also indicate that many sectors within the higher education system now acknowledge the need to show solidarity with academic workers facing political attacks and keep workers’ unions in Israeli academia strong. 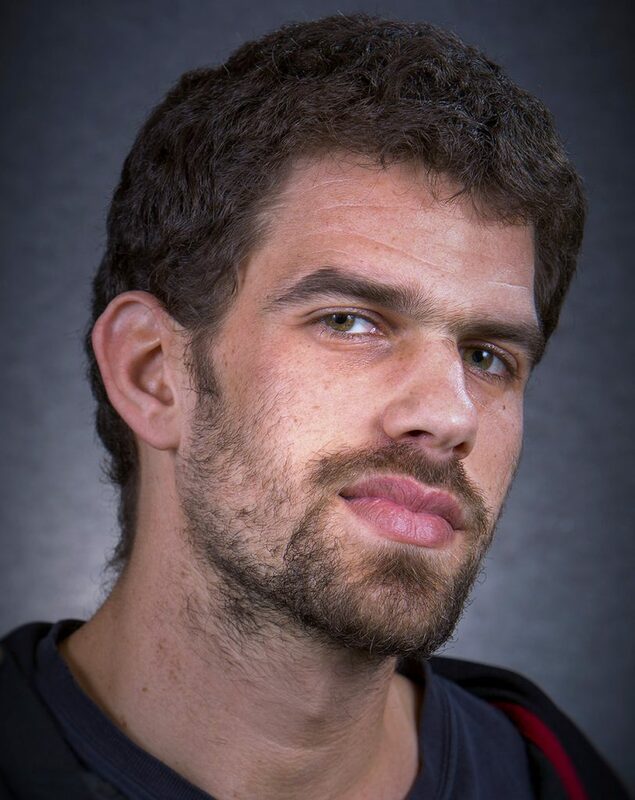 Hayim Katsman is a Ph.D. student in the Jackson School of International Studies, where he researches the interrelations between religion and politics in Israel/Palestine. He received his B.A. in philosophy from the Open University of Israel and completed his M.A. 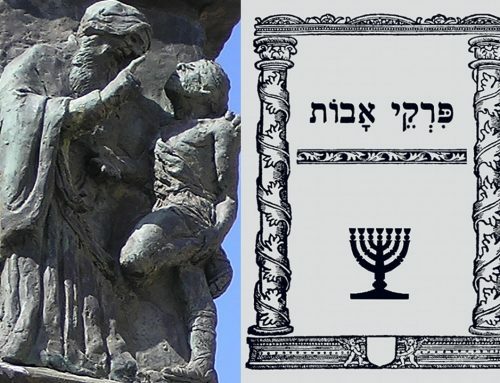 thesis on the theology of Rabbi Yitzchak Ginzburg at the Department of Politics and Government at Ben-Gurion University, where he also served as deputy-chair of the Academic Junior-Staff Union from 2015-2017. Follow him on Twitter or on Facebook.